Vacation home Villa Nedika - Ideal for 3 generation family, for 5+2 persons who will enjoy in a single family home. Full detached house with 3 bedrooms (two double bedrooms and one twin bedroom) + living room (2 sofas can be used as additional beds), fully equipped kitchen, 2 bathrooms, balcony, grill terrace, two parking's, free Wi-Fi, air conditioned... In a quiet location in the center of the Podgora, close to the beaches, restaurants, bars, markets...Welcome!!! Fine pebble beach and clear blue sea...try to find a good place under pine shadow and you will really enjoy! We are located under the highest mountain directly connected with Mediterranean sea, the beautiful Biokovo. We have spent a wonderful time in the nice and confortable villa Nedika. It was the best holiday accomodation we ever rented. Podgora has a wonderful and long beach promenade with a beautiful view to the mountains. We will always remember this great holiday stay and will come again in the future. Eine superausgestattet, sauber und gepflegt Haus mit herzlichen Gastgebern. Für uns es war ein Wunderschöner Familienurlaub. Besser geht es nicht! Sehr schöner Urlaub, toll eingerichteten Haus, sehr nett und gastfreundlich Vermieter. Das Haus können wir sehr empfehlen. This house was everything what we were looking for. Podgora as destination was our choice based on very positive recommendation from our friends...and they were completely right, Podgora is absolutely wonderful destination, very charming, with beautiful beaches and clear sea, not overcrowded but definitely not so small and boring. Since we didn't want to stay in some average apartment in some average house full with other people in other apartments, screaming baby's, noisy guests above/below us...we were looking for the whole house just for us. 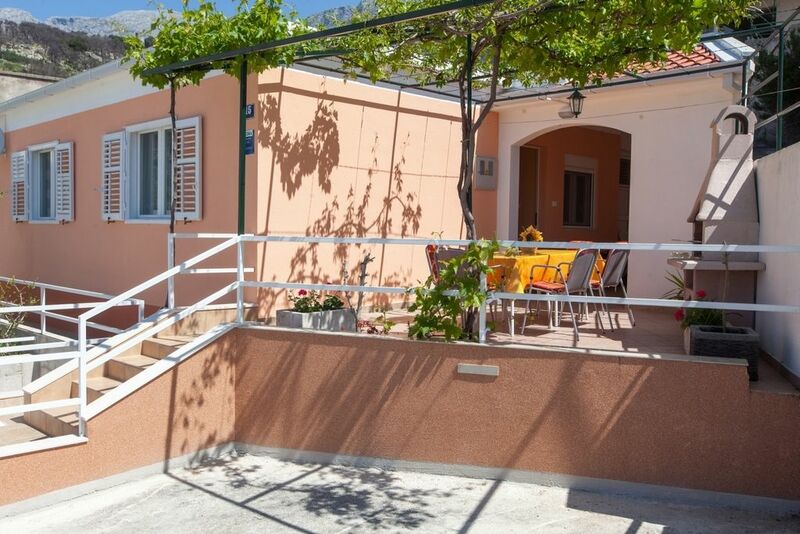 We have found very nice homes in Podgora but all of them were minimum 3 km away from the center and the beach. So, the Villa Nedika was the only reasonable choice for us. And we didn't regret for our choice. The house was like a Jackpot for us. Starting with absolutely kindly, friendly and helpful host who provide us all the info what we were needed, help us with some issues what we have during our stay, organized transfer from/to airport...Thank you Sveto! The house is fantastic and relaxing place. Each room in this house is very comfortable, kitchen is well equipped. The outdoor terrace with barbecue was a perfect place for a relaxing dinner. All is new and everything in the house works perfectly. There's so many small details what makes this house such a perfect place for a summer vacation...mosquito nets on the windows and high speed WiFi was a very pleasant surprise. Great location! Very quiet neighborhood! In a two minutes you can reach everything in Podgora. We were without a car and we didn't need it. The price is very fair and reasonable and for sure you get the value for money. We, 5 persons family (3 generation included), have stayed for a week in this excellent house. The house is very comfortable, clean and completely equipped. The whole interior and exterior are very well furnished and provide everything what you can expect to have in vacation home. Outside terrace with grill and large living were our favorite parts of the house where we could all be together and enjoy. The house is located in the center of Podgora in a very quiet neighborhood. Just few minutes walk and you can reach everything you need…beach, restaurants, bars… We haven’t used our car during the whole stay and it is absolutely priceless when you don’t need to enter in your car during the summer heat. Villa Nedika is absolutely house to recommend and in combination with friendly and helpful host is a guarantee for a relaxing break.